This is one of the simplest ways to prepare a chicken. 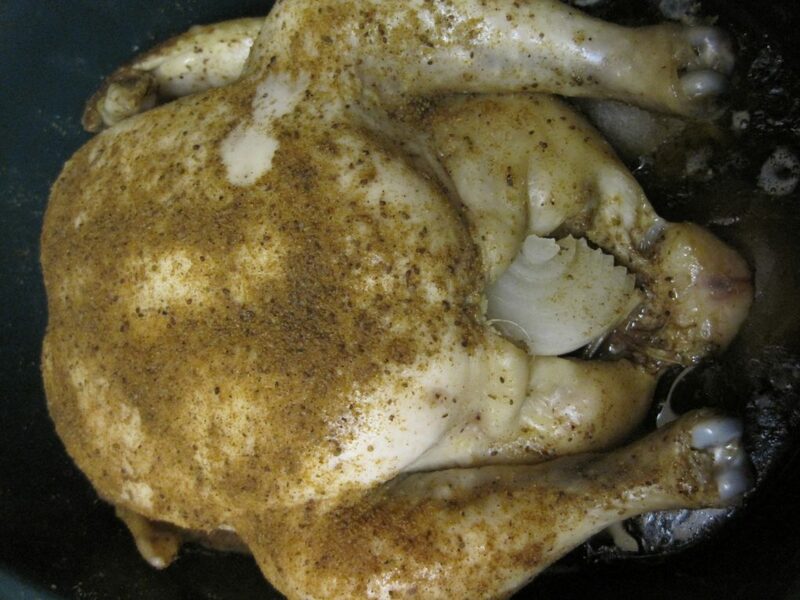 Stick a whole seasoned chicken in the crockpot in the morning and turn it on low. Eight hours later, you return home to a delicious, juicy, fall of the bone chicken. My chicken has cooked as long as 10 hours with no problem. Add a salad and some potatoes or rice, and you have a complete meal. If you don’t want to eat the chicken right away, the meat can be removed from the bones, and shredded to be used to make chicken salad, enchiladas, and added to soup. When you’ve removed all of the meat from the bones, the carcass (skin, bones, and cartilage) can be cooked again–boiled with celery, carrots, and onion to make chicken stock. It’s a versatile recipe that requires very little hands on time. If you’ve never done this, we strongly encourage you to give it a try. It will become a favorite way to prepare a chicken. My sister-in-law was the first person I ever knew who made a chicken this way, and I learned by watching her. She would cook the chicken this way and use it to make sandwiches during the week. You begin by first removing the neck and giblets from inside your chicken. I rinse my chicken, inside and out, and then pat it try. Season the inside of the chicken with whatever spice rub you like to use. We chose poultry seasoning mixed with a little salt and pepper this time. Insert a medium onion that has been peeled and quartered as well as a stalk of celery that has been cut into large chunks into the cavity of the chicken. I use two if the celery stalks are small. These first steps are the same as for an oven roasted chicken. The back of the chicken was dusted with a poultry seasoning blend, then it was placed breast up in the slow cooker on top of the potatoes. 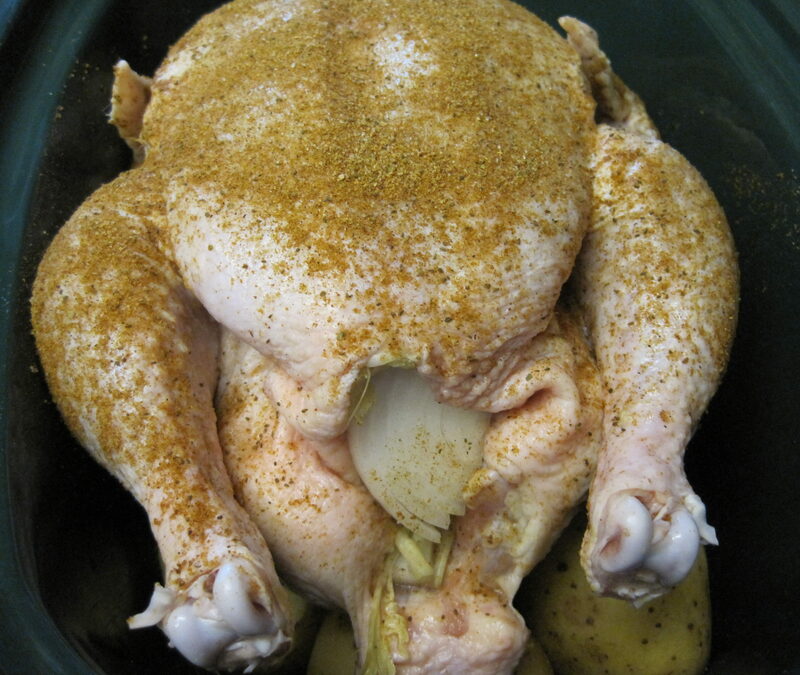 The breast and legs were seasoned with the same spice blend. All that was left was to put the lid on the slow cooker and turn it to low. This recipe does not require any added liquid. We let the chicken cook all day while we were out working and running errands. There is no hard and fast rule regarding the time it takes to cook a chicken in the slow cooker. I have come home to chickens that have begun to fall apart, and there have been times when the chicken is still a big raw around the thigh joints. I suggest that this is one time that you might want to use a meat thermometer to tell you if the chicken has reached the internal temperature of 165 degrees Fahrenheit (75 degrees Celsius). Of course, you can also use a knife and pierce the skin to see if the juices that run out are clear or not. If they’re clear, the chicken is cooked. If the juices are pink, the chicken needs more time in the slow cooker. However you are testing for doneness, don’t touch the chicken with your fingers if you are a food blogger and haven’t taken the photo of the finished chicken yet. Do you see how my photo has two finger sized spots where I removed the seasoning when I stabilized the chicken as I inserted my thermometer? Learn from my mistakes. This method has the benefit of having potatoes already prepared as a side dish. Generally, the potatoes are fully “baked” in the chicken broth by the time the chicken is finished. On occasion, they have been under cooked, but this is quickly remedied by putting individual potatoes in the microwave for a minute or two. On one occasion, the potatoes were very overcooked and mushy. We simply turned them into mashed potatoes by putting them into a bowl and using an immersion blender to puree them. We added only a bit of sour cream to them for flavor because they had already absorbed quite a bit of flavor from the “chicken drippings” in the pan. We didn’t add any water to the slow cooker, but you can see there’s a fair amount of liquid in the pan. This can be used to make a delicious gravy. I usually puree the onion and celery that was cooking inside of the chicken into my gravy for extra flavor. If you don’t want to make gravy, save all of this liquid to add to the homemade chicken stock that you will make from the leftover skin and bones. 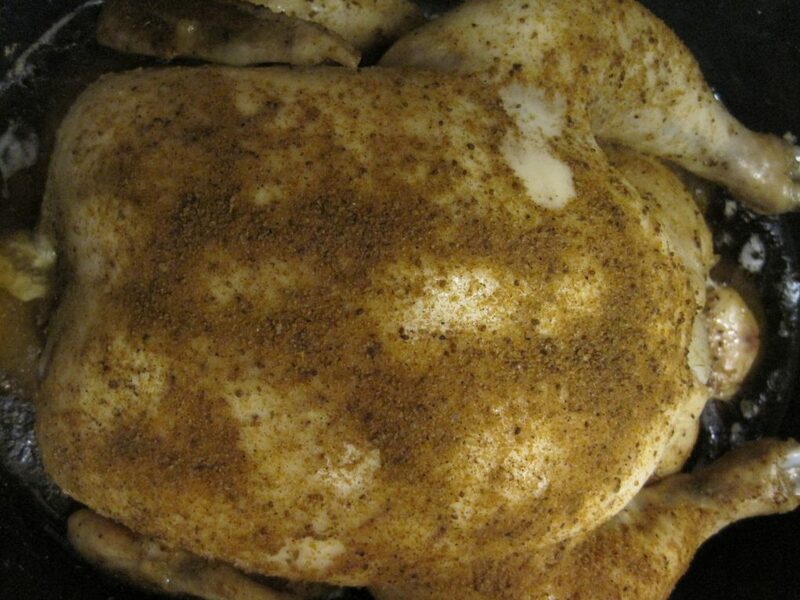 Chicken prepared in the slow cooker will not have crispy skin like an oven roasted chicken. This cooking method is more like steaming than roasting which is why I have never tasted dry breast meat from a slow cooker chicken. If you want crispy skin, cut the chicken in pieces and place it under the broiler for about 3 -5 minutes until the skin becomes crispy. I hope that you’ll give this method for “roasting” a chicken a try. It’s so simple and delicious. Leave a comment and let us know what you think of this technique. Cooking a chicken all day in the slow cooker is a simple and delicious way to get dinner on the table after a long day at work. The chicken can even be prepped the night before and stored in the fridge in the removable crock. In the morning, put the pre-loaded inner pot into your slow cooker, and you're good to go. 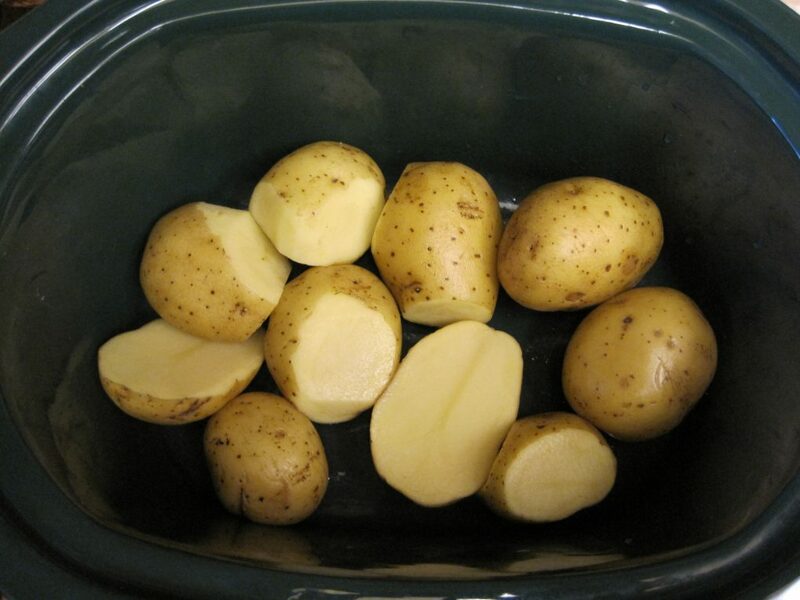 Wash the potatoes, and arrange them in a single layer on the bottom of your slow cooker. Remove giblets and neck from chicken. Rinse chicken inside and out and pat dry with paper towels. 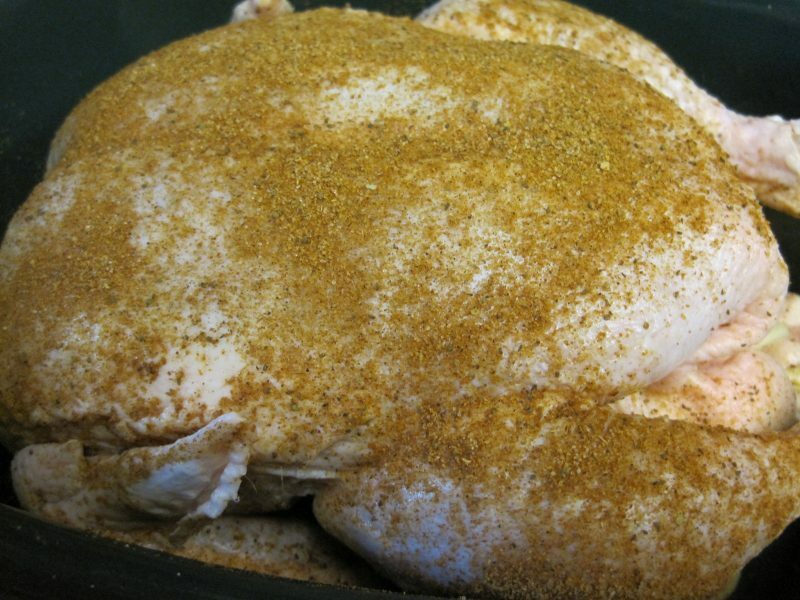 Mix together poultry seasoning, salt, and pepper. 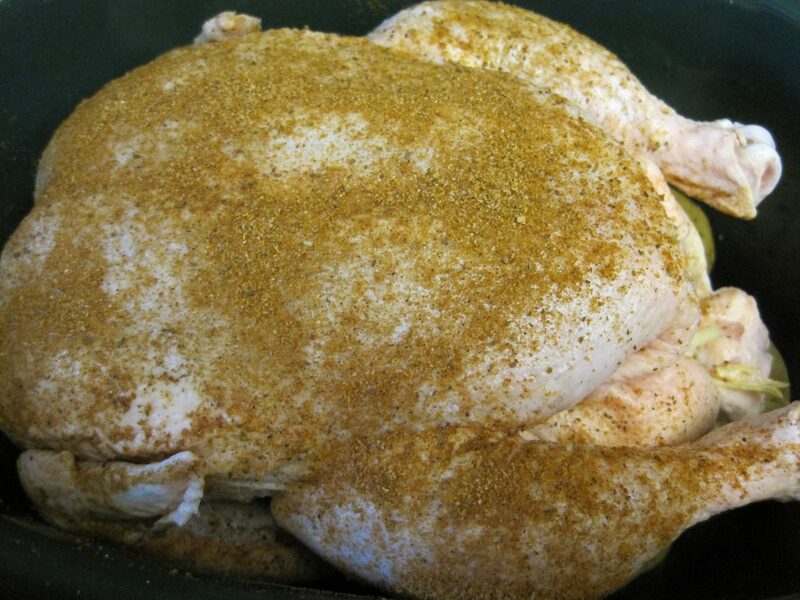 Sprinkle and rub about ⅓ of the spice blend inside of the chicken. Insert onion and celery into the cavity of the chicken. Rub ⅓ to ½ of the remaining spice mixture onto the back side of of the chicken, making sure to rub it onto the thighs, too. Use just enough to cover the surface evenly. Turn the chicken over and place it breast side up on top of the potatoes in the slow cooker. 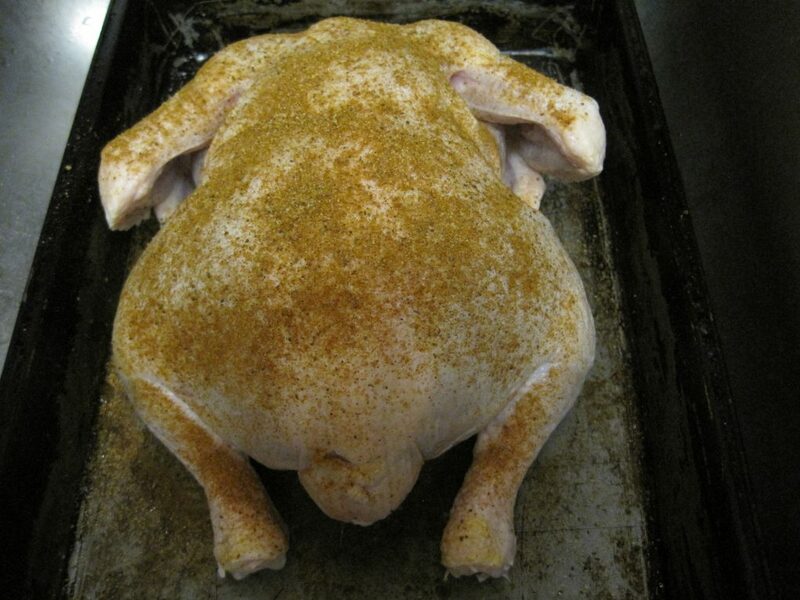 Rub the remaining seasoning onto the breast, legs, and wings. Place lid on slow cooker, and turn it onto low. Allow to cook for 8 to 10 hours until the chicken is completely cooked. (165 degrees Fahrenheit with meat thermometer). Remove chicken carefully from slow cooker. Serve with potatoes and a vegetable or salad. Your slow cooker chicken technique looks very easy and sounds delicious. I like the idea of putting the whole chicken in the crockpot. It’s great if you know you’ll be using chicken in several dishes during the week. You have a whole bird cooked and waiting when you get home.